Chris Hein – Ensemble Strings is an incredibly detailed, flexible and musical string-ensemble-library. A special characteristic of this library is the fact that the ensemble-sounds have not been recorded in a group. Instead, the carefully selected and matched instruments have been recorded separately and edited. Consequently, each instrument is perfectly in tune, offers excellence in timing and still (or thereby) seamlessly fits the ensemble’s sonic character. You won’t find a wrong note that ruins the whole ensemble. Chris Hein – Ensemble Strings have been compiled out of a pool of over 120,000 samples of violins, cellos and double basses being combined to harmonic ensembles. Each individual recording was carefully adjusted in tuning and timing as well as placed in the stereo panorama. Subsequently, these files were mixed with other recordings (naturally in 24 bit resolution) to build up an ensemble. Because of this procedure, articulations such as pizzicato or col legno can be played in “loose“ and “tight“ versions. Both sections offer up to eight dynamic layers. As in Chris Hein – Solo Strings, Ensemble Strings offer four “dynamic modes“, functions such as “note-head-designer“, “key-vibrato“, “hot-keys“ as well as the practical concept of articulation-presets which, in combination with the user-interface, really give the musician the feeling and impression to play these instruments live. 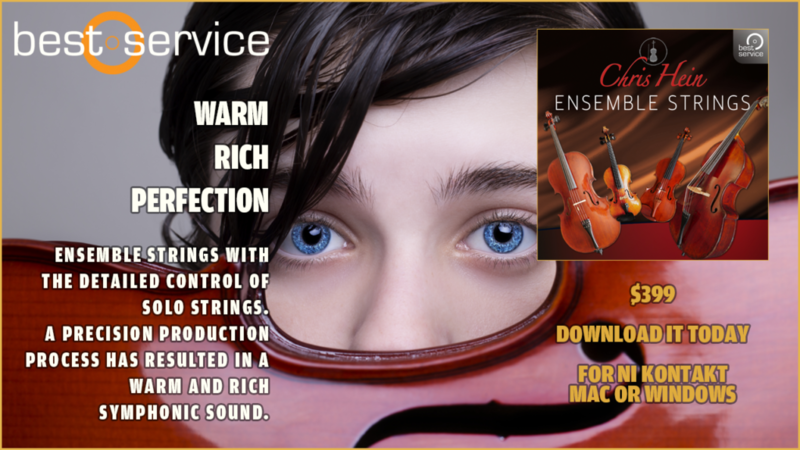 Chris Hein – Ensemble Strings and Chris Hein – Solo Strings perfectly play together. The string ensemble provides the best possible background for solo instruments. Although offering ensemble-sounds, this library features the so called Ensemble Maker known from Chris Hein’s solo-libraries. Here, several voices can be layered to create an even huger sound-impression. A voice-partitioning in the stereo-panorama and fine detuning increase the effect. Needless to say, that all articulations are still available here.